These are our local mountains, looking southeast. The orange numbers are statute miles from Crystal airport. The red initials indicate special sweet spots where its usually possible to climb from low hills up onto the BIG ones. First, note that the NORTH arrow points down and to the left. 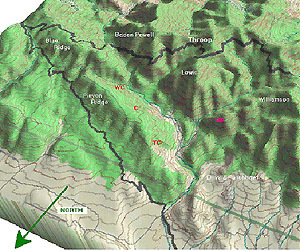 The north slopes also are shaded. Straight up in this view is southeast. Now, where to start? Let's begin in the morning with our typical light wind. As early as 9:00 AM, you can tow to Morning Mountain (MM) to catch the day's first thermal. You'll need a minimum of about 6500 feet of altitude (3100 feet higher than the airport.) which is just slightly lower than the peak. This earliest lift rises over the dark rocks of the steep southeast face, and requires very narrow circles either southeast of the peak or directly above it. As th©e lift builds and you gain altitude, you can work your way south, up the ridge, toward the higher crest of Mt. Williamson. Within an hour or less this earliest lift will be dwarfed by bigger, stronger, thermals from all around the area. Another advantage of this as an early starting point: if you fail to find lift you can glide northeast across the canyon (to the left in this view), to Pinyon Ridge and still have a good chance of hanging on a little lower. Even the few minutes it takes to get there may allow enough extra time for other thermals to begin. The locals here most often refer to Pinyon Ridge as "the second ridge". Despite its unspectacular appearance, it's an amazingly dependable source of thermal lift - plus lots of other good stuff as well. There are three especially sweet spots on the south face, but throughout the day there is often solid weak lift or zero sink with very strong thermals imbedded along the full length of Pinyon Ridge. The 'work camp' (WC) is at its best in west winds, when the canyon upwind feeds it with extra energy. The lift drifts up over the head of the canyon, to the left in this view. Minghelli's Chimney (C) is usually the very best. It sometimes starts as early as Morning Mountain, and it typically works all day, to the very end. On any afternoon from March to November, there may be soarable lift at the Chimney all the time. And in winter, when there may be no other thermals anywhere, there is probably at least something happening here. Situated at the west end of Pinyon Ridge, it has maximum exposure to both south and west winds, and receives the best sun exposure late every day of the year. (The one condition that can spoil thermal lift on Pinyon Ridge is a strong south wind bringing downslope sink from higher terrain. But even then, Tony's Corner lies directly in the way of the solid wind flowing down the big canyon between Morning Mountain and Mt. Lewis. This, therefore, is one of the very best places to climb from down low, up into WAVE. So much for the big four little places. Now what about all the fantastic lift everywhere else on a typical day at Crystal? East of the work camp a small notch leads up to a bigger, longer hill named Blue Ridge, which is often not as ideal as Pinyon. Yet, at other times IT is the prime location for very strong shearlines - and other goodies. In light winds from any direction there is generally good to very strong thermal lift directly above any sharp ridge crests or peaks in our local mountains - and there are miles of those nearby. 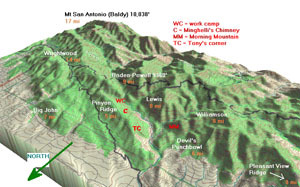 From a first climb at Morning Mountain or Pinyon Ridge, the best next step is usually Mt LEWIS. This is perhaps the finest thermal source for 90 miles or more in any direction. REALLY. Often you can approach this 8100 foot mountain, even below the peak, and simply fly around it once or twice, climbing almost all the while. Here you can expect numerous thermals from all sides at once, joining at the top. Above this peak the thermal lift just goes on up and up… But even before climbing high, from there you can run south, across Route 2, up the ridge to 9000 foot Throop Peak. On the way, the lift will probably be continuous, so long as you stay directly above the ridge crest. Imagine heading straight toward a peak that lies above you, and lowering the nose as you gradually rise up, over the highest point! From there you either do a 270 degree right turn before heading east, to sample the thermal above that peak, or simply bang a left and run on, through plenty of ridge-top thermals, east to the highest peak in the local area, Mt. Baden Powell. Here again, as at Mt. Lewis, we have an isolated cone collecting thermals from several different faces, and more lift than you may know what to do with. Here it might be a good idea to climb a bit - at least to 10 or 12 thousand feet - before running on across a large canyon to the ski area atop Blue Ridge, four or five miles northeast. Note that the NORTH arrow is pointing straight down (it's also pointing in the direction of Crystal airport, which is about three miles off the map . Often at Crystal, SHEARLINES are the best thing on the menu. We discuss the mechanics of soaring shearlines on the next page down, but for now let's just say that the yellow ones operate much of the time. As the day goes on, they usually migrate inland (to the north or east), and when they do, the orange ones build in from the west. The big shear that exits our map to the lower left usually runs solid to the north, clear across the Antelope Valley, to El Mirage, and then northeast toward Barstow.